I know two versions of how the Chocolate Hills came to be. The first one, something retold to every Filipino schoolchildren during grade school, involves fighting giants throwing mud at each other (good thing they weren't fighting using handbags), and the mounds of mud left behind from the fracas became the hills. The other, not as fantastic as the first but way more plausible, was explained by my Geology 11 professor in UP. In this version, limestone that rose up from the ocean was sculpted by the drip-dripping of rainwater over a geological timescale into the shapes that we see today. I'd pick the first one if you asked me which version I liked better. But magical origins or not, these hills became a must-see attraction in their own right. 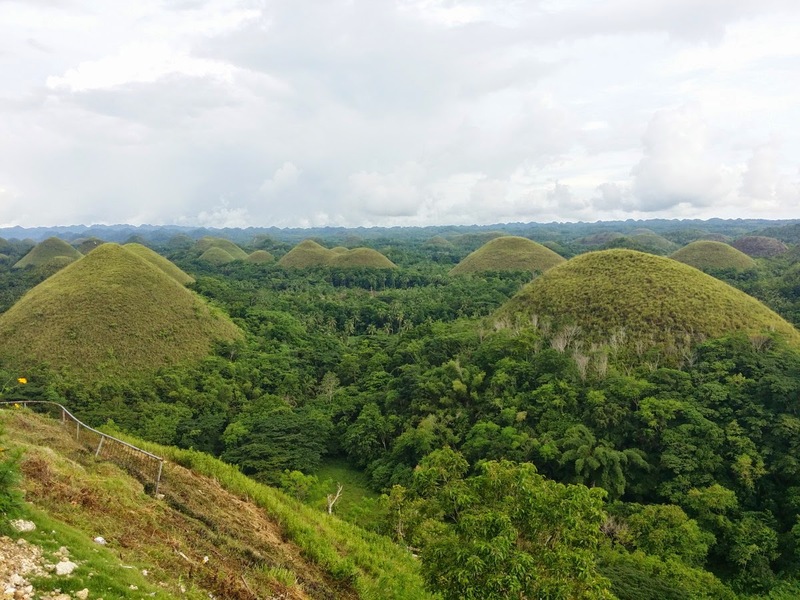 In fact, the Chocolate Hills are perhaps the most iconic of all the attractions in Bohol, rivaled only by the cutesy face of a tarsier. 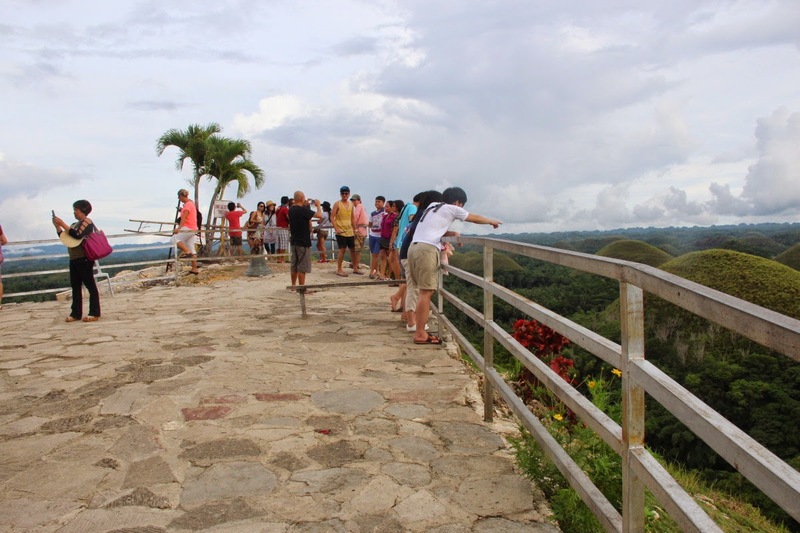 The geological formation, located at the town of Carmen in the central part of the island, is composed of about 1,200 to 1,700 hills (depending on who's counting). The hills are, as my Geo 11 prof said, composed of limestone and were formed several millennia ago by the slow action of rain and wind. 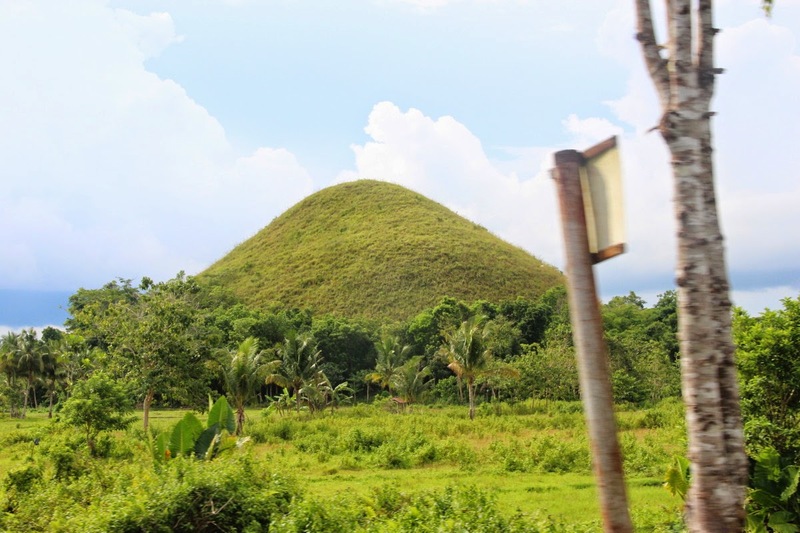 We got to see the Chocolate Hills during our last visit to Bohol. We actually went there on the last full day that we were in the island, lumping the trip there with a visit to the tarsier conservation area and a cruise in Loboc River (more on those in the next posts). It was in the middle of the afternoon when we got there. The air was balmy although the sky was overcast and the sun is barely peeking from the clouds. The ride from Tagbilaran to Carmen was below an hour, passing over several towns, a man-made forest, and bucolic scenes that seemed to have popped out of a Fernando Amorsolo painting. As we get closer to Carmen, the gumdrop-shaped hills began to appear in view, colored green by the grasses growing over them. In the dry months these grasses will become brown, turning the stumpy conical hills'appearance like that of everyone's favorite candy. The viewing deck is located in a hill, called Chocolate Hills complex. A parking lot and a restaurant is located about halfway up the hill. We parked here and proceeded to climb up to the viewing deck. Arvy counted it - it's 214 steps all the way to the top. The damage caused by the 2013 earthquake was apparent in some areas of the viewing deck, part of which collapsed due to the tremor. A few hills were damaged by the quake too, some with collapsed sides that show its limestone interior. Even though I've seen hundreds of pictures of it already, it was still an awesome thing to see in real life, the countless conical hills stretching all the way to the horizon, a unique landscape created by dripping water given enough time to do its handiwork. Or maybe we have irate giants mud wrestling each other to thank for that? 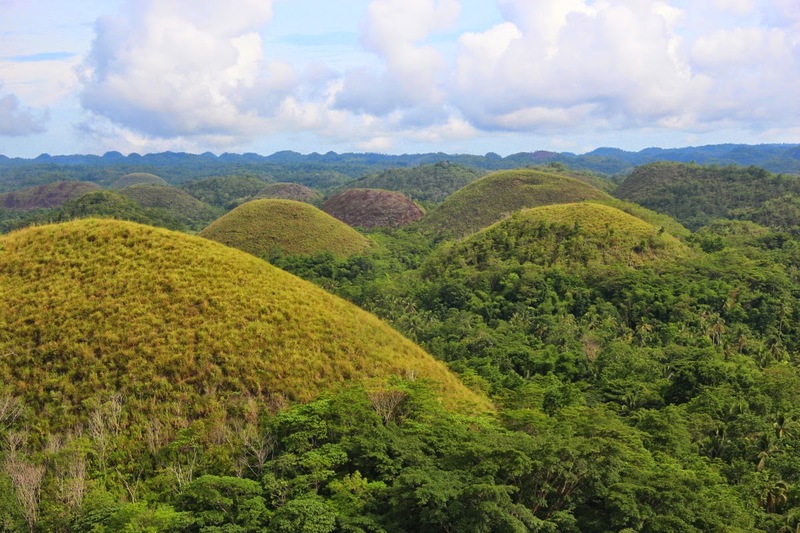 The Chocolate Hills are primarily located in the town of Carmen in Bohol island, Philippines. You can hire a vehicle from Tagbilaran, about 50 kilometers from Carmen, to take you there (you can hire it for a day and have it take you to here and other attractions around the island). We hired one, a Mitsubishi Adventure, for about PhP 2,500 for one day. 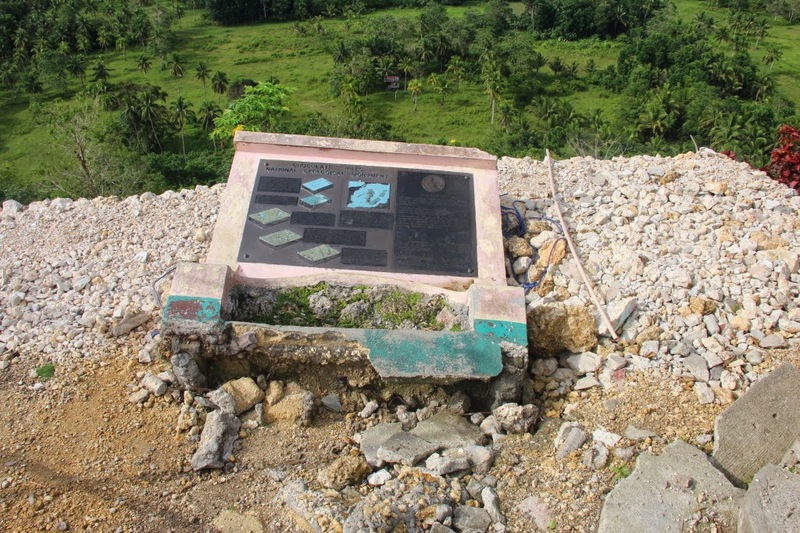 An alternative viewing area is located in Sagbayan Peak, in Sagbayan town. It is located 75 kilometers northwest of Tagbilaran. 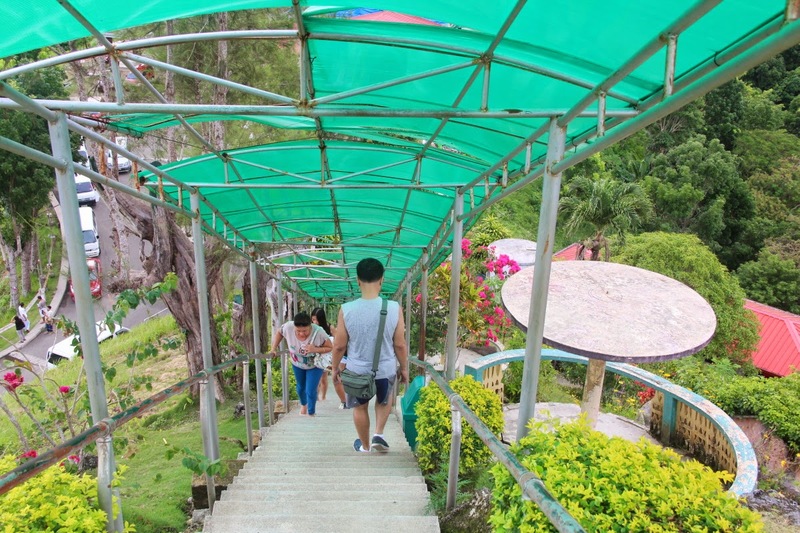 An entrance fee of PhP 50 is collected per person before you enter the park. Uy, covered na yung stairs (patchy nga lang) going up the view deck. Is Geo 11 a required subject in the History curriculum?